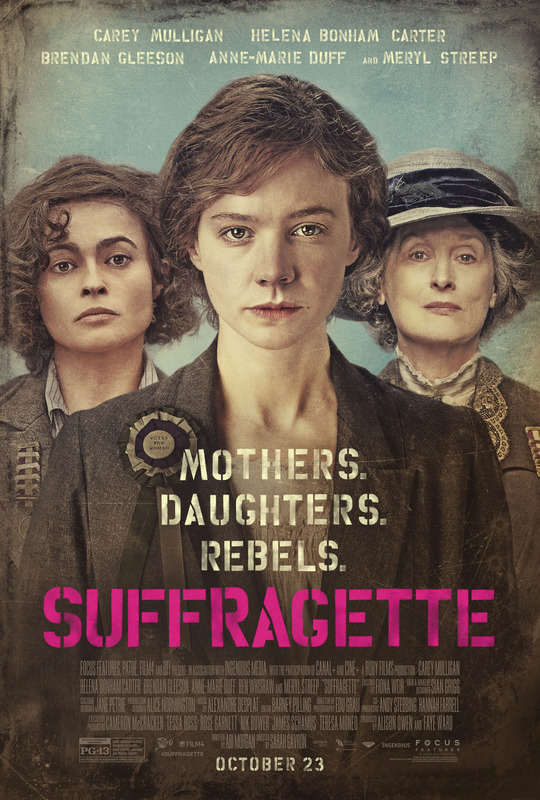 I felt both anticipation and dread about the movie Suffragette. And yes, it was difficult to watch, as many reviewers have already noted. Of course, the events in Suffragette took place not so long ago. And an improvement in women's rights since 1920 has made some complacent and forgetful about our forebears' sacrifices. But hang on, the exceptional thing that Suffragette did well, was to show how ordinary people are radicalized by their oppression. This is the tremendously current and relevant theme we should be discussing, using Suffragette as reference point. The "radicalization of terrorists" has become a buzz-phrase in media discourse and it's very much come to invoke a racialized other. Suffragrette is presenting the process of radicalization, but the subjects are white British women. Yes, they're in another time period, and still utterly relatable. Make no mistake, the suffragists portrayed in this film were radicals. They were willing to obliterate any sense of comfort they had in their lives, and indeed, willing to lose their lives, in order to see social change. They were willing to destroy property and even use suicide as a tool for change. They were not, at least in this film, willing to use violence against other people -- and that's where the example departs from much of the "terrorist radicalization" that stirs fear via the U.S. media. This is critical: there's a difference between the kind of activism to which we give our time, activism that may effect our livelihoods, and that which can kill us. Both can be courageous and Suffragette portrays the latter. The main character, Maud Watts (hauntingly played by Carey Mulligan) begins and remains a very relatable woman. This is the film's contribution to public discourse: her journey as a radical feminist activist . It's a journey translatable to many types of activism and extremism. Hers is a journey born of suffering. And actually, Maud had it reasonably good. She was a pretty 24-year-old woman with a beautiful family and she was the floor manager at the laundry where she worked. She was neat and respectable and her son George said goodnight to a photo of King George before hopping into bed each evening. Sure, she made s a pittance at the laundry where she and her husband worked and they lived in a damp hovel. Sure, she endured sexual abuse from her boss, as she had since she started working there as a child. Sure, her husband was in charge of the household but what did that matter until they disagreed? He was supportive in everyday ways and not violent; many husbands were worse. Maud was jarred into action by witnessing the anger and actions of suffragists in her community, and by noticing the cyclical nature of sexual abuse in her workplace. Something shifted when she walked in on her boss assaulting a new twelve-year-old worker, in the same way that she had been indoctrinated into workplace sexual violence. And still, it wasn't until a turn of events caused her to make a testimony she didn't intend to make that she seemed to hear her own words, hear her own life. As she offered court testimony about her working conditions in the laundry, she realized that the vote would help women. She dared to hope that it would help women like her, women like her friend's daughter at work in whose eyes she saw her own life reflected. As she heard herself speak about her own mother working in the laundry and dying when she was four from the harsh conditions, and about how she had risen through the ranks from child laborer, her voice became stronger. When the magistrate commented on her achievement to be a floor manager at 24, she stated simply that women don't live long in that profession. She really seemed to hear herself. It was a radical thing she said. Her life expectancy was already low and she had no real options to change that. The film also does an excellent job of portraying how much social class influenced women's roles in the suffrage movement. The solidarity among women across social class was real, and also limited. In one case, this became clear when a wealthier woman's husband paid her bail after a group of women were arrested. She tried to pay for the other women's release as well, but her husband refused, despite her protests that it was "her money." No, in fact, as a woman, it was her husband's money. The others were imprisoned. Once Maud's hope for a better society became real, she realized how much she had to gain as a human actor in social context, even if it meant losing her family - and it did mean that and more. She participated in things she'd have never imagined previously. This is the very real human conversation we could be having about Suffragette. There are people in the world today who feel just as Maud did. We may not know many of them personally, or indeed we may. But the fact is, any among us could be moved toward radical acts, given the right circumstances. As refugees pour out of embattled regions of the world, and our own nation teems with politicians whose remarks are not only exclusionary but fascist, this film has far more to offer than a historical lesson on feminism, though it offers that as well. Yes, it's a painful film to watch. And as we seek to find and forge our places in our currently troubled times, Suffragette is well worth watching and discussing.